I was inspired by a post on Food 52 (one of my favorite food websites!) 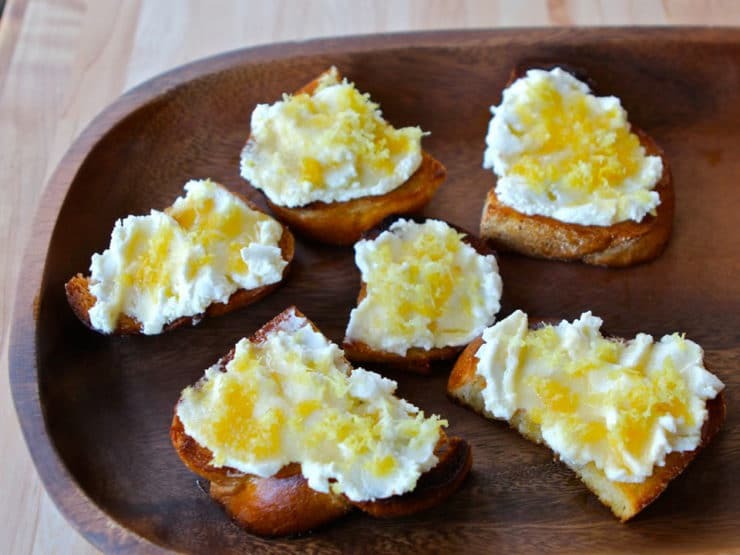 in May, where co-founder Merrill Stubbs described a simple and mouth-watering Bruschetta With Ricotta, Honey, and Lemon Zest. Salty and sweet with a bright touch of lemon… how could that be bad?? I wondered how this concept would taste on lightly charred challah slices. Challah has such a terrific flavor, and when lightly toasted it really sings—crispy on the outside, soft and moist and eggy on the inside. I thought it might suit this recipe perfectly, so I put the idea on my “to try” list. Sukkot seemed like the perfect opportunity to give this recipe a go. The Jewish holiday of Sukkot is a harvest festival, and bruschetta is traditionally served during the olive oil harvest in Italy. The dish was developed to show off the season’s new oil during the Italian olive harvest. 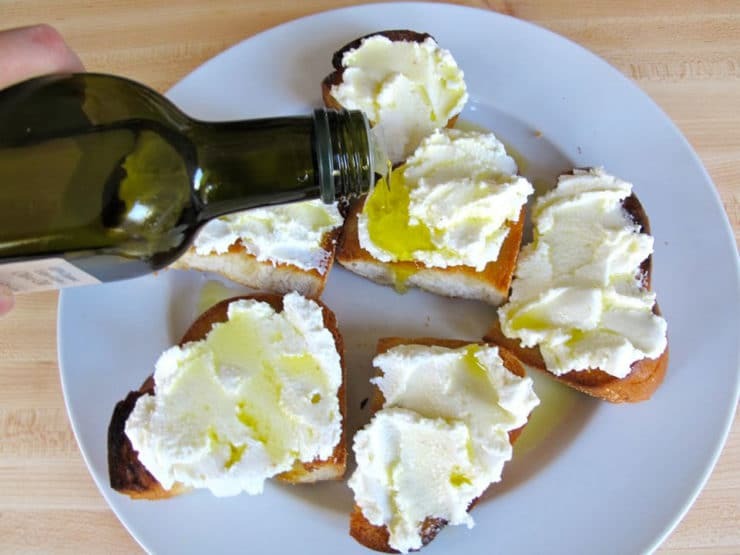 I learned about bruschetta on a culinary trip to Tuscany, where we sampled freshly pressed olive oil at an olive farm about 2 hours outside of Rome. 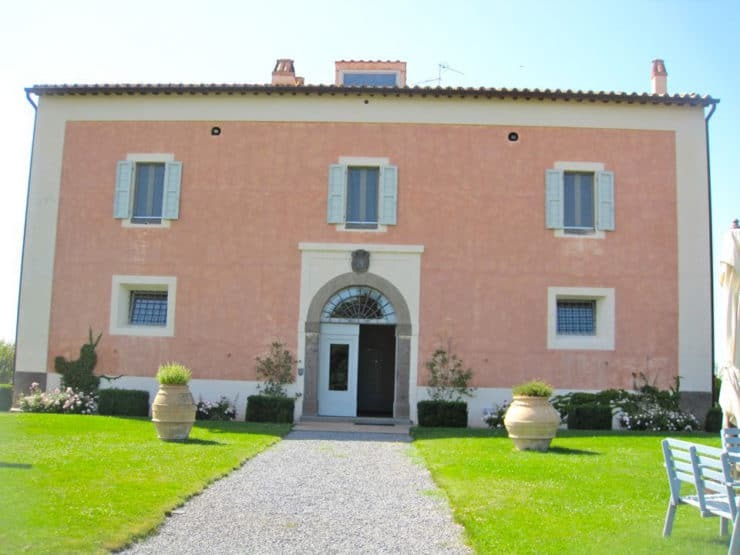 The farm is called Frantoio Archibusacci G & F; it’s been there for generations. While there, we learned how olives are harvested. They also taught us a bit about the history of the farm, which was founded in the late 1800’s by a Tuscan oil trader. 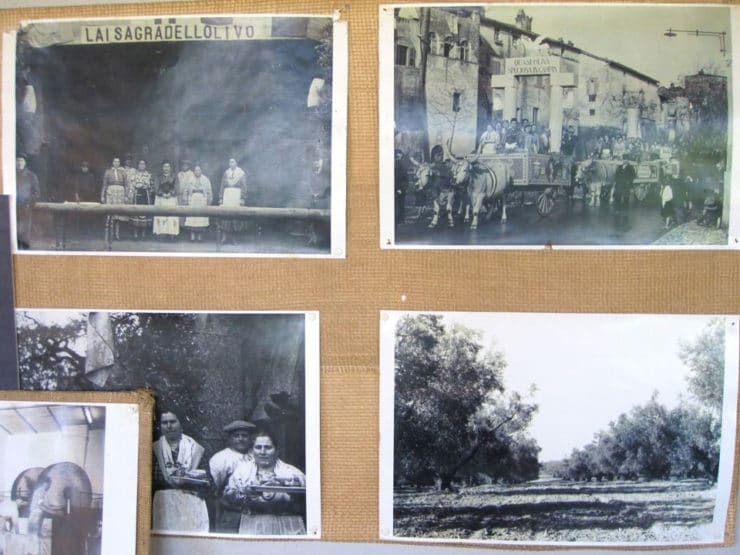 It was purchased in 1935 by the Archibusacci family, who grew it into a thriving olive oil business. Today, the farm produces cold pressed extra virgin organic olive oil the old fashioned way, by stone grinding the olives. 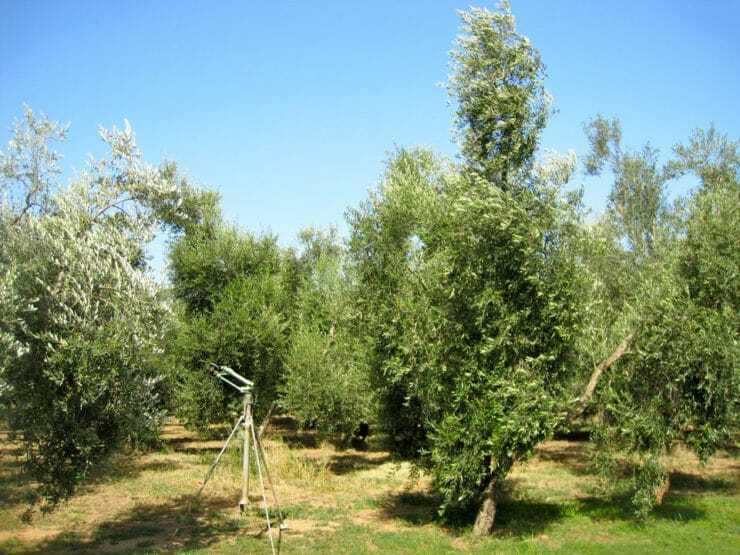 Archibusacci is known for having a “slightly fruity” flavor, and has been ranked as one of the top ten olive oils in Italy. After a short lesson in olive oil production, we got to sample the good stuff. Bruschetta is traditionally made with only four ingredients—bread, garlic, olive oil and salt. The bread is toasted and rubbed with garlic. Then, the garlicky slices are drenched in olive oil and sprinkled with salt to taste. Over time, fresh seasonal ingredients have been added to enhance the bruschetta concept. One of the most popular combinations is ripe tomatoes, fresh basil, and garlic. Sometimes chopped olives mixed with olive oil are mounded on top. And of course, there are delectable cheese versions, like the one I’m sharing with you today. 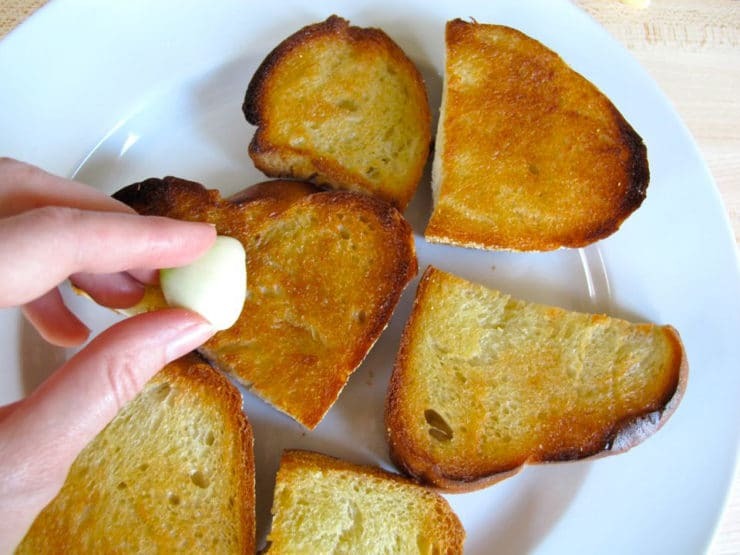 No matter how fancy a bruschetta might be, four things always remain the same—bread, garlic, salt, and olive oil. 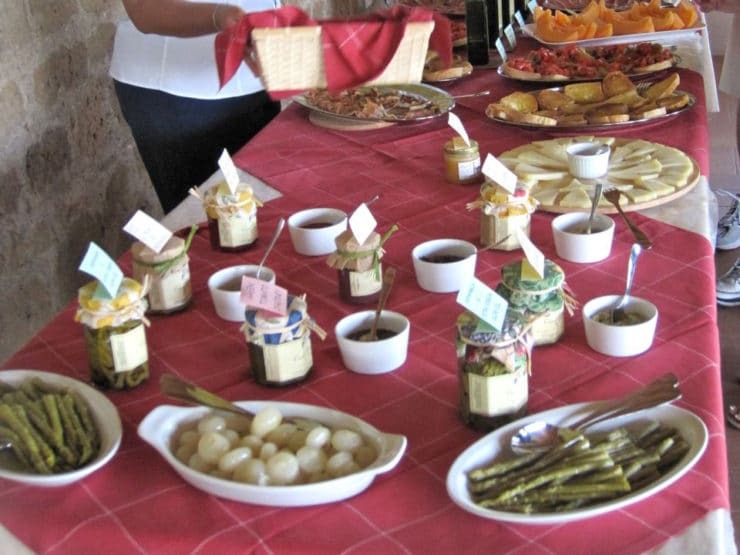 Bruschetta = olive oil harvest, Sukkot = harvest festival. Appropriate? Yes. Delicious? Absolutely! You guys are going to love this one. Simple, rustic, divine. I didn’t change much from the original recipe besides using challah as the bread; I did add a bit of fresh lemon juice to the ricotta for a more pronounced lemon flavor. Choose the best quality cow’s milk ricotta you can find (the highest quality is usually the most expensive; buy whatever your budget allows!). Make sure you choose a nice quality extra virgin olive oil, too. I found that a light colored honey works best flavor-wise. I prefer sprinkling the bruschetta with sea salt, but kosher salt can also be used if you prefer a more coarse salt texture. 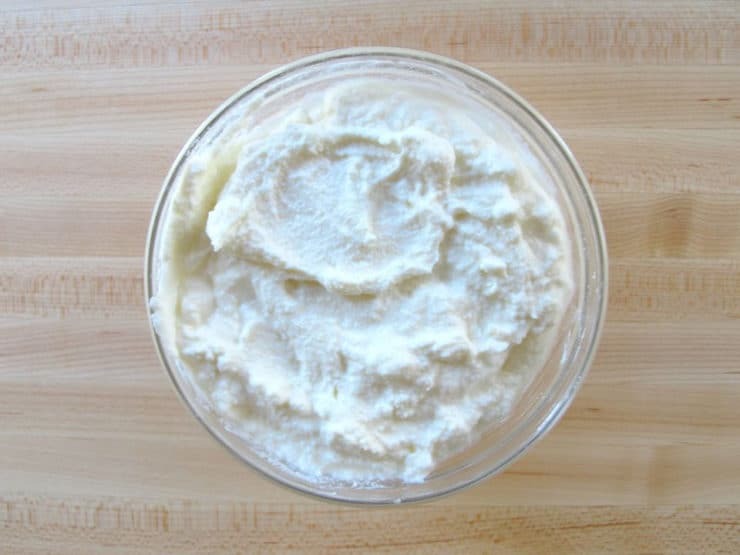 If you’re a vegetarian, look for a vegetarian ricotta cheese (no animal rennet). 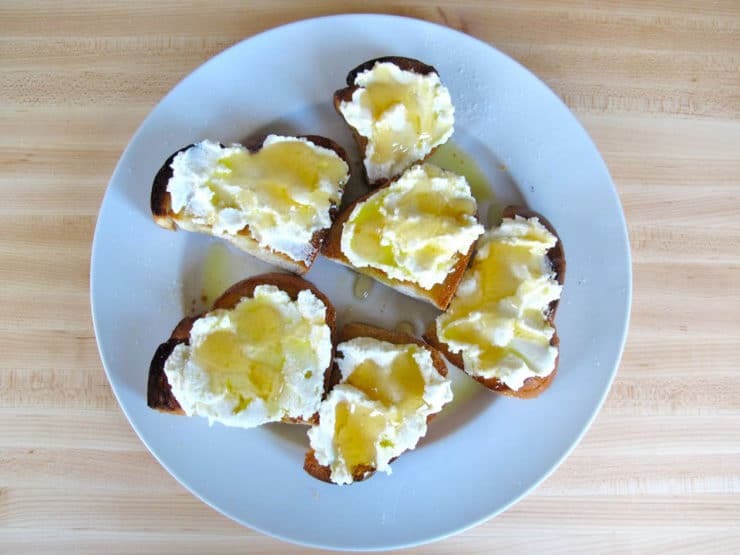 Recipe for Challah Bruschetta with fresh lemon ricotta, olive oil, honey, lemon zest and salt. Appetizer, kosher, dairy. Before you begin, zest the yellow part of the peel from the two lemons using a fine microplane grater. Reserve the zest. Juice both of the lemons. Stir the fresh lemon juice into the ricotta cheese with a fork. Reserve the ricotta. 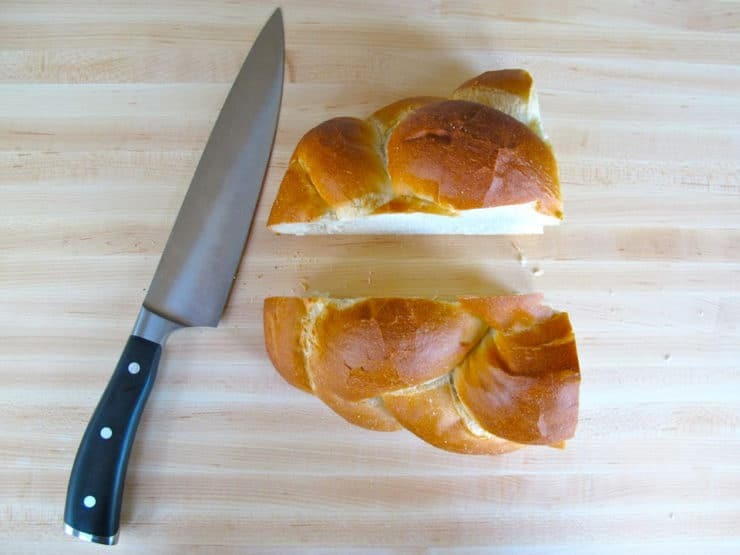 Slice the halved challah loaf lengthwise to create two long, thinner loaves. 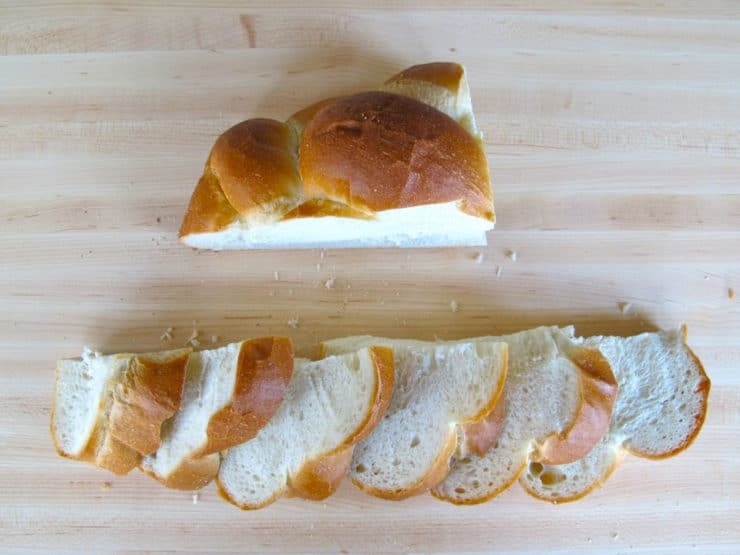 Slice each loaf into slices that are about ¾ inch thick. 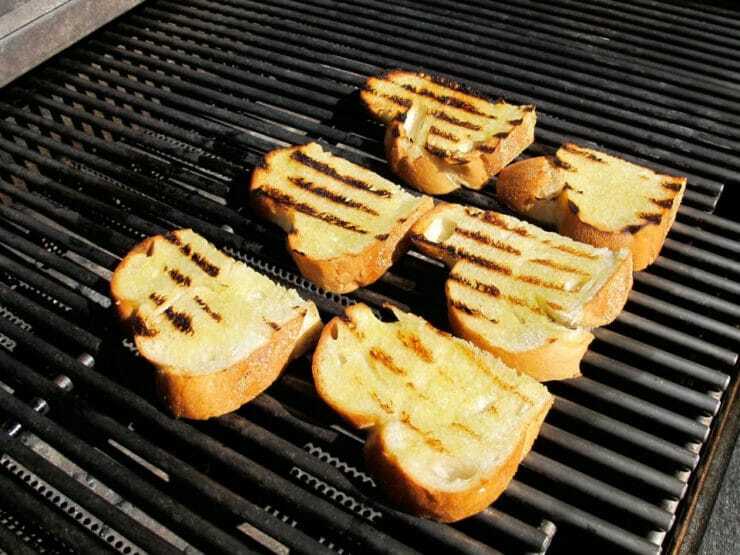 To char the bread, you can grill it or broil it. If grilling, make sure your grill or grill pan is preheated before you start. 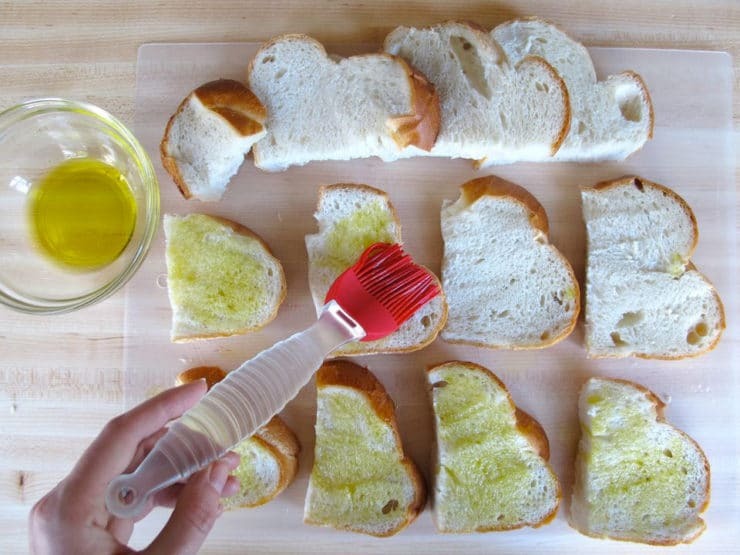 Brush both sides of each challah slice lightly with olive oil. Put the bread to the grill or griddle, and cook until slightly charred on each side, about 2 minutes per side. 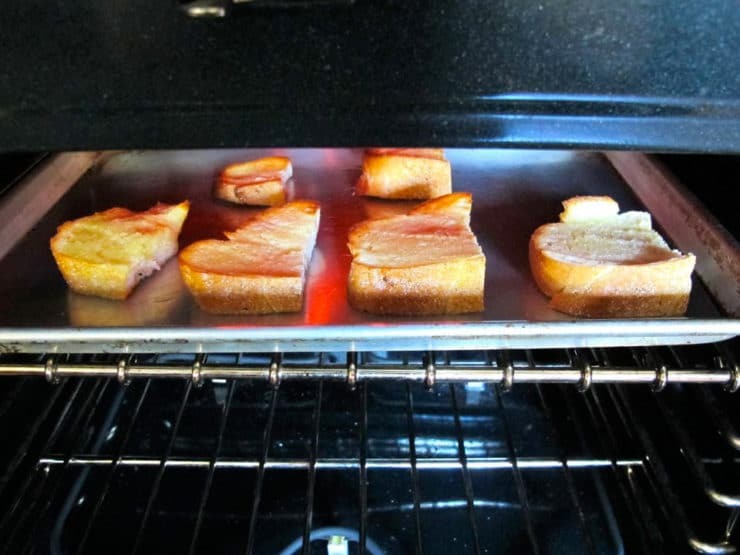 Alternatively, broil the bread slices about 3 inches from the heating element, flipping them after about a minute and watching them closely to make sure they don’t get overly cooked/burnt. When the bread is charred to your liking, remove it. Cut the peeled garlic clove in half. Rub the toasted side of each slice lightly with the cut side of the garlic clove. To the side you've rubbed with garlic, add a generous smear of ricotta (best to leave it kind of messy and rustic-looking). Drizzle slices with more olive oil and sprinkle with salt. Drizzle a bit of honey over each bruschetta. Sprinkle each slice with a generous amount of lemon zest. Tori, how do you think this would be on a matza sheet instead of bread. I was thinking of serving this as an appetizer for the Sedar. Advisory: for those who follow halacha, it is not permitted to use a challa that was cut and leftover from a meat meal for a dairy meal. Very interesting recipe. From the photo I assumed it was entirely sweet, a sort of breakfast thing (though I don’t mind garlic for breakfast anyway). The note about no animal rennet being important for vegetarians is, of course, important for people observing kashrut too. Hi Faye– it does look a bit sweet in the picture doesn’t it? I’ve served it as an appetizer in the past, it seems more suited to that purpose, though I’m sure it would make a nice breakfast too! Re: animal rennet, while the vast majority of kosher cheeses are made with microbial rennet, I was surprised to learn recently that some kosher cheeses that do contain animal rennet. Seems counter intuitive, but it’s true. Zabar’s in NY sells a kosher parmesan imported from Italy made from kosher animal rennet. Surprising, no? That said, I’m pretty sure that most (if not all) OU-certified kosher cheese is free of animal rennet. Best for vegetarians to double check, though. This is my breakfast for tomorrow! Had them as last Shabbat dinner. Oh, so delicious! Thanks, again, for sharing. Made this tonight for a snack before dinner. Oh its so good!!! Love your site, thank for the delicious treats! OMG just when I think you can’t top your last recipe, you come up with another I am sure you can’t top. It is a lot of pressure but I can’t wait until next week! That is so sweet of you Cookie, thank you! Oh my gosh Tori! This looks so good! My daughter will absolutely flip when I make this for her. I can’t wait to make this…and I have everything on hand! Tori – so glad to get to know through Andrew! Love this post – I started my blog in large part because of an olive oil experience in Spello Italy – it was life changing. Love this idea of using challah. Wonderful! Every bite of these little treats sounds delicious. The honey dripping off is really what did me in. Those look amazing! 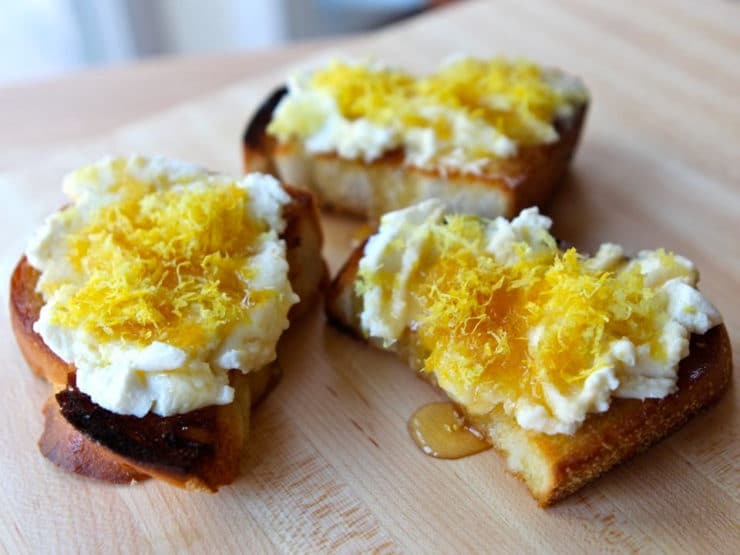 I love the lemon ricotta and the honey..how divine! What a GREAT idea! 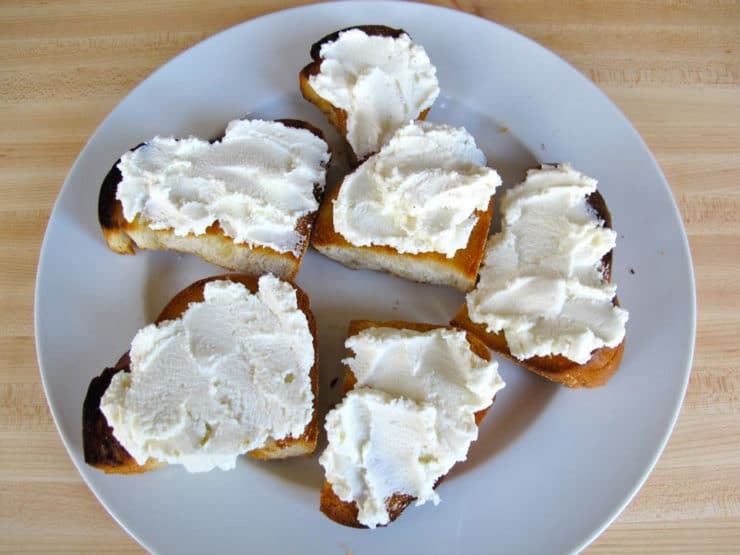 I love the idea of ricotta, lemon and honey….and to put it on challah? *sigh*. I’ve visited Food52, but haven’t poked around as much as I’d like…I’ll have to check it out! Thanks! It’s a great site! They also have some fun cooking contests. Wow. That must be one of the most unique bruschettas I’ve seen, and I absolutely love it!! I’m off to France this week, but once I come back, I’m getting some challah and trying it out. I think it’d be perfect for a nice Saturday! I love bruschetta and so I am REALLY loving this new idea for a topping! I’m also crazy about lemon so you can bet your bottom dollar that I am making this for my next get-together! What a great, simple, appetizer! Love the flavours. It is simple, isn’t it? Thanks for stopping by Lynn! I’ve never used challah for bruschetta before–great idea and a terrific use of slightly stale bread! It’s a great flavor match! The challah has a natural sweetness to it, so I went light with the honey and let the salt/lemony flavors take center stage. Speechless… WOW…!! This is a Great one Tori… :).. Thanks..
Looks awesome! I love using challah in my recipes- I have made challah French toast, challah bread pudding and an awesome apple challah grilled cheese! Looks very delicious!!! I may have to try this!!! Go for it Millisa! It’s so simple, and the flavor is really amazing.